As the website manager for the Vancouver International Film Festival (VIFF), I led the project for the re-design of the festival’s website. 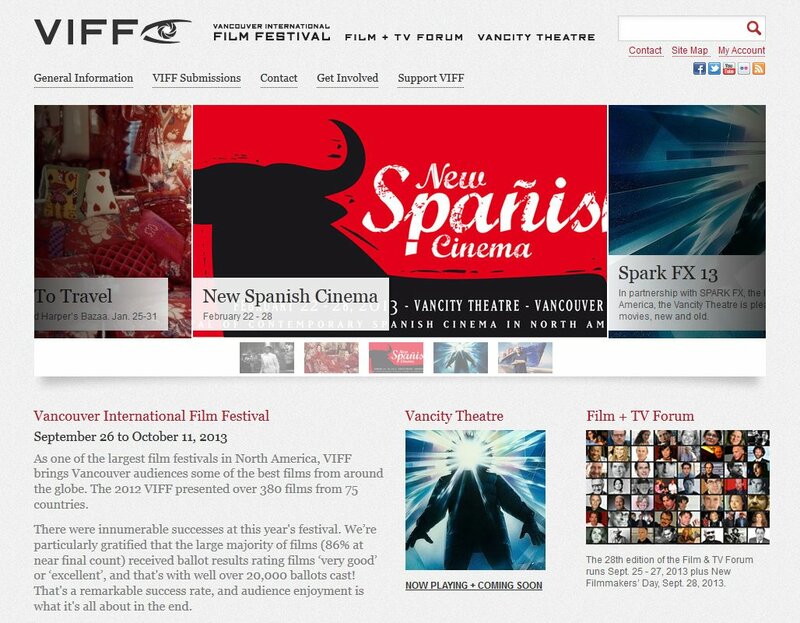 Unify the three sub-components of VIFF (the Festival, the Film + TV Forum, and the Vancity Theatre) under one site and with common branding. There had previously been 3 different sites, each with a slightly different look and feel. Create an searchable film guide listing, a functionality that had been part of the previous online ticketing platform (TixSys), and integrate it with the new online ticketing system (AudienceView). We wanted to bring the film guide functionality into the main website. Build a site that would serve as a good base platform for further development, including further integration with the ticketing system, and for mobile application development. The project was done in an extremely compressed time frame (8 weeks), for a scope that would normally be done over several months, due to the requirement to get in done in time for the 2012 Festival (site launch by mid-August 2012). Define functionality requirements for the site, and prioritize around a minimal viable product for the first phase of development. Work with internal stakeholders and the selected developers (Appnovation) to determine the functionality and information architecture of the site. Participate in the Agile development process – attend scrum meetings, act as the point of contact for developers’ questions, approve functionality as delivered, report bugs, approve fixes. Translate the business requirements from VIFF into technical requirements for the developers. Posted on February 2, 2013 by peter in Projects and tagged Drupal, information architecture, planning, project management, VIFF.